Don't mess with Jonathan Van Ness! That's the lesson an online hater learned after taking on the "Queer Eye" star. It all started yesterday when Bravo posted a clip from the Netflix star's recent appearance on "Watch What Happens Live with Andy Cohen." In true Van Ness style, the grooming expert showed up to the talk show in a stylish yellow sweater, cropped denim and some serious footwear. The reality star has a unique look that stands out from the crowd, but Instagram user Zachary Morad, who previously appeared on Bravo's show "Welcome to Waverly," apparently isn't a fan. After seeing Bravo's post, Morad shared his thoughts. 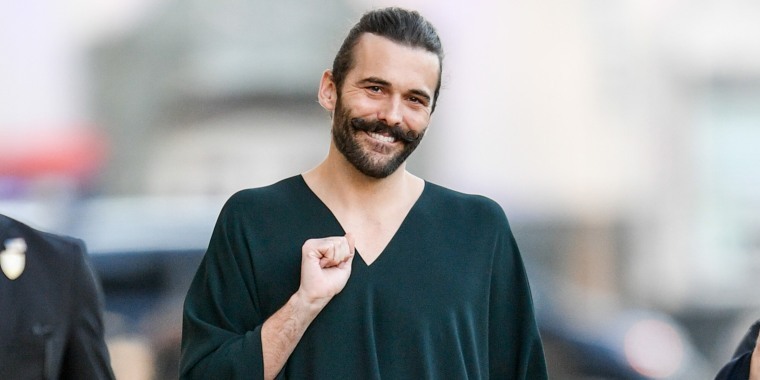 Fans of "Queer Eye" rushed to Van Ness' defense, praising the 31-year-old for staying true to himself. Instagram user @samkreis wrote "@jvn I love you and your side part 😘 I hope whenever people are jerks to you for no reason you remember how many lives you touch and inspire! Keep doing what you’re doing 💕" while @xokathh kept the message short and sweet, writing "@jvn ur fabulous baby." Some, like @kate_gemma, even pointed out the ironic misspelling in Morad's post: "@jvn you are heaven on earth! Also what is @zacharymorad 'expecting' for the mustache? Bc I’m expecting it to be fabulous and it’s delivering 🙌🏻"
It wasn't long before Van Ness himself fought back, with a touch of his signature sass. Morad stood by his statement initially, and even replied to several Instagram users. In response to @jillie__mae, who said she adores Van Ness' side part, Morad wrote "great! I love it! Different flavors for everyone. I personally think he should stick to a center part. Love the sweater tho!" After @sandscasey wrote "@zacharymorad hun keep trying. But try a nicer route. You’ll get some attention one day!" Morad replied by saying ""@sandscasey lol ya’ll are the ones giving me attention right now haha .. @ me all you want ... I still think the handlebars have to go." Eventually, Morad took to his own Instagram account to apologize for his comment. "This morning I got caught up in some insta drama because of a comment that I didn't take seriously as I wrote, but that so many of you have now seen and have. I want to apologise to Jonathan Van Ness, who as I have come to understand ALWAYS promotes positivity and continues to be an advocate for all," he wrote. Morad continued, "Jonathan I want to apologize to you directly because truthfully we all have feelings and I would hate to have hurt yours with my careless choice of words. The only wrong people are the ones who can't admit when they are wrong." Now, can we all just get along?